I make many decisions with a toss of a coin. The trick is knowing when it’s appropriate. When I couldn’t tell which choice was better, I used to think it was a “hard decision.” Now, I recognize that maybe both options are equally good. The decision becomes so easy a coin can make it — so I let it. You suddenly know what you’re hoping for. I think this is also how Two-Face from Batman decides things. Not totally sure that’s the right model to go with. 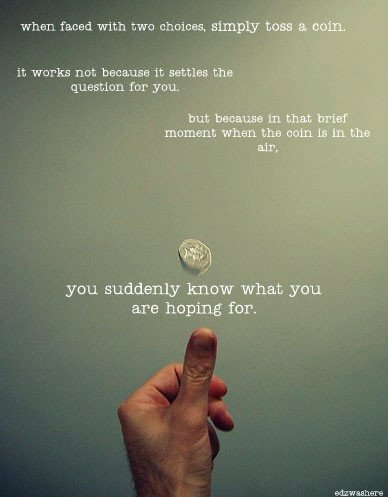 You’re right: there are many circumstances where flipping a coin is a terrible way to make a decision. I still like how deciding to give up control can clarify what I actually want.